Everyone knows that a salad is good for them but the task of preparing a tasty salad is frequently perceived to be somewhat a challenge. Don’t over think it I say and follow your culinary instincts. Even if you haven’t seen that combination before, throw it together, you may just create something beautiful. If you’re opting for the leftover approach (as I usually do), stick your head in your fridge and cupboard, and have a looksie around. Which vegetables and protein sources need to be used up? It could be leftover meat, tinned tuna/salmon or even some trusty boiled eggs. Do you have any tinned legumes such as chickpeas, butter beans or lentils? Have you got any marinated or pickled vegetables? Are there some nuts/seeds just waiting to be used in something? Olive oil. Check. Something acidic like lemon juice or vinegar. Check. If you would like your salad to be more substantial perhaps you have some couscous or penne pasta you could bring to life with some water. You don’t need all of the above ingredients to make a beautiful salad but the more you have, the greater the possibilities. Bearing in mind, less is usually more and often the most simple of salads are the best. If you’d prefer to plan your salads in advance, choose your source of inspiration whether it be cookbooks, magazines, Google, or even my humble little blog. Write yourself a shopping list and off to market you go! 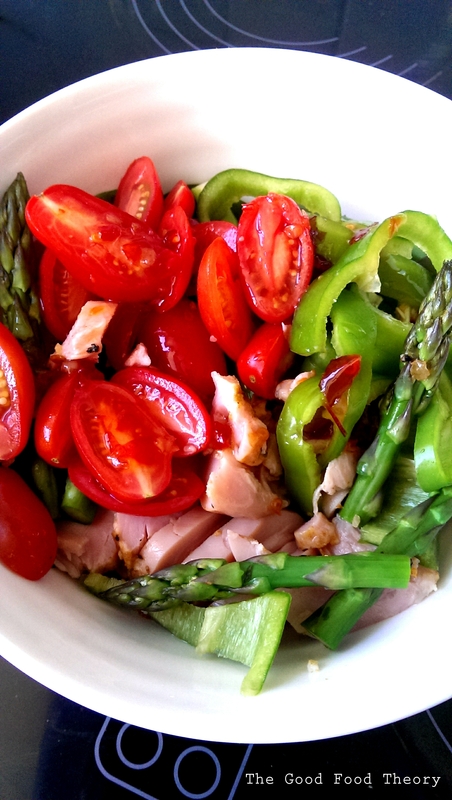 1) Grape tomatoes, green capsicum, steamed asparagus and smoked chicken* with a dressing of sweet chilli sauce, olive oil and lemon juice. 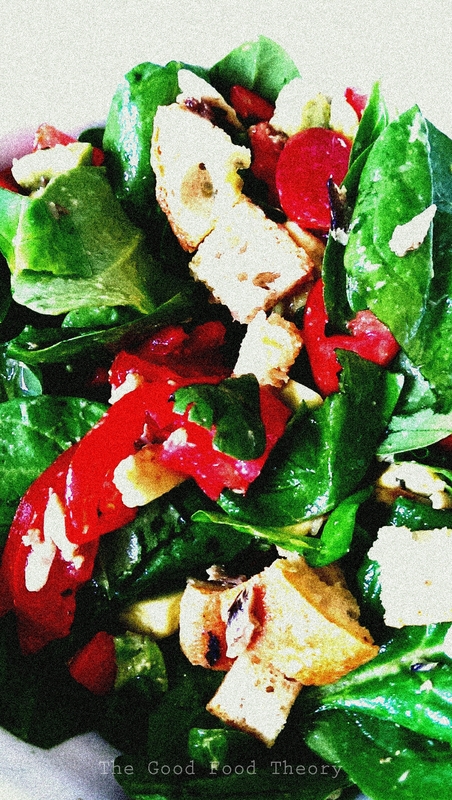 The vibrancy of the contrasting red and green is just beautiful (and delicious). 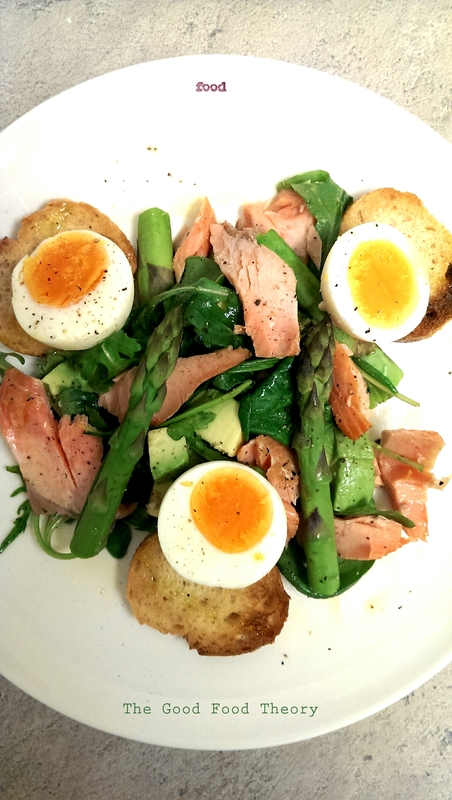 2) Hot smoked trout*, avocado, steamed asparagus, rocket, boiled egg and leftover baguette, thinly sliced and toasted. With a simple olive oil lemon juice dressing and freshly cracked black pepper, this salad is just divine. 3) Roughly chopped tomato, avocado and leftover baguette with rocket and tinned fish (be it sardines, mackerel, tuna or salmon). A little black pepper, a little more lemon juice and a Jamie Oliver splash of olive oil brings all the ingredients together. *When writing this I noticed the use of ingredients such as smoked chicken and hot smoked trout. I also acknowledge that these aren’t necessarily your everyday leftover ingredients. These are not frequently found in my kitchen but I do tend to purchase a random protein ingredient each time I do the main grocery shop. Sometimes it is hot smoked trout, sometimes it is tinned tuna. Both are delicious. I hope this has provided you with some inspiration to make some beautiful salads this summer, thereby effortlessly increasing your vegetable intake and the nutrients found within.